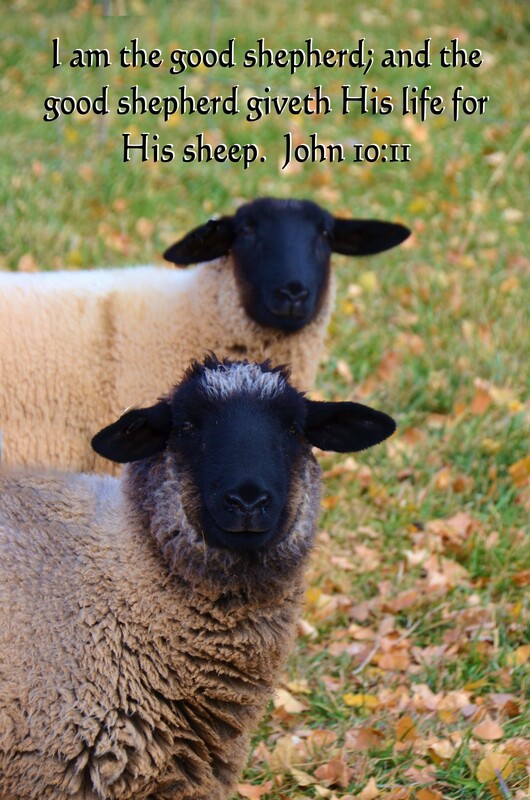 The Lord, our good shepherd gave His life for His sheep. We are the Lords Sheep! It’s hard for many to compare themselves to sheep. I think you have to give your life to the Lord and thus come into the sheepfold, to really realize what being a sheep means. Sheep are stubborn, and have need to be led. The Lord longs to lead us and take care of us like the good shepherd that he is. My daddy was a truck driver and on occasion would haul sheep, and cattle. Mom took me and my brother on night to see our dad where he was loading sheep into the truck trailer for shipment. They were refusing to go up the ramp into the trailer,so my Daddy got on his hands and knee’s and went up the ramp baa-ing like a sheep. They all followed him up the ramp. I was probably about 4th grade at the time but I never forgot how those sheep had to be led. Its true,, we as sheep, need a leader someone to follow and trust. There is none other shepherd that we should follow than Jesus. He goes after the one that is lost, He feeds the sheep, protects the sheep, loves those sheep, and basically, gives the sheep everything they need. Are you acknowledging that you are a sheep? Have you decided to follow the shepherd?